I realized with some sheepishness, after writing about Bruce Sterling's story "The Black Swan," that I had only read second-hand accounts of Nassim Nicholas Taleb's Black Swan idea, but not his actual book of that title. So I ordered it, and now have read the book itself. A "black swan" as defined by Taleb, is an event of "rarity, extreme impact, and retrospective (though not prospective) predictability." Taleb is an ex-quant turned iconoclastic mathematician. 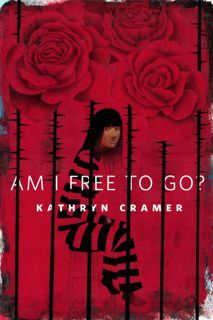 This book was a bestseller, and like many best-sellers on arcane topics, it is chatty, opinionated, and a bit on the loose and sloppy side. Other than having it confirm my belief system (always a pleasure), there were two basic things I got out of reading this. In the second half of the book Taleb spends a lot of wordage and emotion on condemning the "intellectual fraud" of the Bell Curve. I don't really need to be able to judge whether he is correct in terms of all of his examples. But it set me thinking about standardized testing. Last week and this week, the school district is doing extensive testing of my son, which they do every three years. (This is separate from the group standardized testing.) When my husband I meet with the district in June, we will be presented with a sheaf of paper in which, page after page, our son will be raked in terms of percentiles and numbers of standard deviations from the norm. And we will try to make sense of all this data. Again. Years ago, I read Stephen J. Gould's The Mismeasure of Man (another book which confirmed my belief systems) and I have a deep distrust of standardized testing anyway. And yet these tests mean something, and it is of crucial importance that I understand what. In past cycles of this, I've wasted a lot of time reading up on what is meant by "processing speed" and how to understand things like the results on subtests of IQ tests. So I'm reading along through Taleb's attack on the uses of the Bell Curve, and I realize that of course all of these tests are normed to Bell Curves. They wouldn't give them if they weren't. But all around me I see human attributes that do not fit that model: the ability to draw a recognizable portrait, the ability to play the piano, gender, eye color, etc. Many human differences are not meaningfully normalized to the Bell Curve. And so I realized there was one further aspect of what these tests measure that I need to keep in mind: that the imposition of percentiles and standard deviations on what attributes are measured may be no more realistic than contemplating a spherical cow. We somehow need to try to consider whatever we're told each of these these tests are measuring is distributed Bell-Curve-like over the population, or whether it is a different kind of thing. I find this a bit daunting, though probably worth trying. What are the three forms of a number? The question "What are the three forms of a number?" came home on a worksheet in my son's homework. I have a math degree and work with real math in my daily life. I can think of lots of different forms a number can take, but was unable to come up with the trinity of number forms on my own. I have a mind like a steel sieve, so I thought maybe I'd learned this but had forgotten. So I Googled it. Google was no help. The only Google hit for "three forms of a number" is an oblique reference to a Powerpoint presentation for teachers. And so I consulted a Prentice Hall book entitled Preparing for the New York State 6th Grade Math Test which my son had brought home from school, and in that book, there is an answer to this question. Am I to conclude that the idea that there are "three forms of a number" is an invention either of the authors of the New York State 6th grade math test, or of text book writers? Or is there out there in the world, some other provenance for this coinage? Help me out here. I want to know. Are they teaching to the test? Or what? I am unsettled by the idea that a reason that it is necessary to teach to the test is that the test authors are making up new mathematical coinages of their own that students are responsible for regurgitating. UPDATE 9/24: So I had a meeting with the teacher yesterday. In summary, the phrase I reacted to comes from the Everyday Math curriculum that was in use in the elementary school when Peter was there, and so there was an expectation that students would recognize it in that form. Other answers differing from the Everyday Mathematics formulation would have been acceptable and were accepted with full credit. (The district has since replaced the U. of Chicago's Everyday Mathematics with a different curriculum, at least for my daughter's first grade class.) Peter's teacher is not using that curriculum (thank God!) at this point. The use of NY State practice tests was as a tool to assess what gaps in knowledge were there to be addressed, but the day-to-day classroom curriculum is not particularly oriented toward the test except as necessary to meet state standards. I'd say I over-reacted to the assignments given by the middle-school teacher based on experience with the attitudes of the more testing-oriented elementary school teachers. Based on our conference, I'd say that preliminarily, I think the situation with the math class is going to be at least fine, if not better. So my reaction was not baseless, but my experience as a Chappaqua elementary school parent left me with enough post-traumatic stress that I can be a bit quick on the trigger to judge the middle school which is, in the words of a local pediatric psychiatrist, a good bit more "touchy feely" in its academic stances than our elementary school. The picture below shows the computed stresses in a simple 2D model of the I-35W bridge, with red meaning more stress. (I got the geometry from news pictures.) There are definitely aspects of the model that are not realistic. For example, the weight of the trusses themselves isn't included. And, of course, it's in 2D. So what happens if one of the trusses weakens? It's easy to include this in the computation by adding an upper bound on the stress in that truss. That just adds another inequality--which FindMinimum has no problem with. One sees that when the truss with maximal stress weakens (shown in yellow), the stress spreads out to other parts of the bridge. If one weakens the next truss, then the stress propagates further. And when one weakens yet another truss, then the constraints can't be satisfied at all any more--so there is no static equilibrium for the bridge, and the bridge cannot stay standing.
. . . it's been known for a while that the best networks don't have that kind of simple structure. In fact, they almost seem in some ways quite random. Well, what about bridges? I strongly suspect that there are much better truss structures for bridges than the classic ones from the 1800s--but they won't look so simple. I suspect one can do quite well by using simple rules to generate the structure. But as we know from NKS, just because the rules to generate something are simple, it doesn't mean the thing itself will look simple at all. Two students at our NKS Summer School (Rafal Kicinger and Tom Speller) have investigated creating practical truss structures this way--and the results seem very promising. Wikipedia allows the use of B.C.E. instead of B.C. and C.E. instead of A.D. The dates are based on the birth of Jesus, so why pretend otherwise? Conservapedia is Christian-friendly and exposes the CE deception. . . .
Wikipedia often uses foreign spelling of words, even though most English speaking users are American. Look up "Most Favored Nation" on Wikipedia and it automatically converts the spelling to the British spelling "Most Favoured Nation", even there there are far more American than British users. Look up "Division of labor" on Wikipedia and it automatically converts to the British spelling "Division of labour," then insists on the British spelling for "specialization" also. Enter "Hapsburg" (the European ruling family) and Wikipedia automatically changes the spelling to Habsburg, even though the American spelling has always been "Hapsburg". Within entries British spellings appear in the silliest of places, even when the topic is American. Conservapedia favors American spellings of words. . . .
Wikipedia has many entries on mathematical concepts, but lacks any entry on the basic concept of an elementary proof. Elementary proofs require a rigor lacking in many mathematical claims promoted on Wikipedia. . . . The Wikipedia entry for the Piltdown Man omits many key facts, such as how it was taught in schools for an entire generation and how the dating methodology used by evolutionists is fraudulent. . . .
Oh, goodness. I wonder which mathematical claims were felt to be unchristian or subject to liberal bias. Conservapedia is aparently a project of Andy Schafly, son of Phyllis. Until very recently, I thought all blogs had traffic patterns rather like mine: that there was a certain baseline level of traffic punctuated by huge spikes. For non-ego related reasons I happened to compare my traffic with that of some other sites, and discovered that my traffic pattern seems to be the exception rather than the rule. Given my baseline readership, I seem to have the largest volatility in blog traffic I can find. I think I know why my traffic behaves that way. I just don't understand why everyone elses's doesn't. The closest match I can find for my traffic patterns is Making Light. (And I think this is attributable to a shared blogging philosophy.) But Patrick and Teresa Nielsen Hayden start with a much higher baseline readership and still don't have traffic spikes as high as mine. Is anyone measuring this sort of thing? Why does my traffic behave this way? Partly because I take the idea of the blogger as public intellectual seriously, and partly because I am interested in the problem of how to re-envision the data served up to us by the news media, and that on occasion, I have been very successful at that. UPDATE: Here's a link to a page on the mathematics of volatility in the stock market. 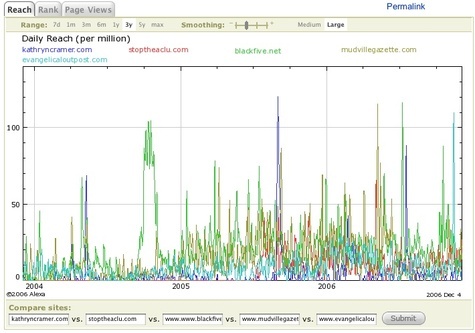 The difference between stock volatility and blog traffic volatility is that blog traffic mainly moves up from a baseline and then returns to traffic of a similar order of maginatude, whereas stock volatility can go in either direction, through the roof or through the floor. Guess what? I still win. OK. So this is great for my sense of self importance in the world and all that, but what the heck is going on here? Am I unique, or am I representative of a specific type of blogger? This is Year's Best season for us, and so I've been reading lots of short fiction, which ought to give me a lot to say in this space, but instead leaves me sort of stunned. If you have a favorite science fiction or fantasy short story published in 2006, now is the time to tell me about it. One thing I found out about this weekend is Rudy Rucker's podcast of his fine story, "Chu and the Nants" published in Asimov's. I told David about it and he was pleased I liked it because it is part of Rudy's next novel, Postsingular, which David is publishing at Tor in a year. Meanwhile, Rudy's new novel, Mathematicians in Love, just came out. Put it on your Christmas list. On a not entirely unrelated topic, I have been surveying the Nerdosphere for worthy math and computation-related blogs, and have noticed the interesting phenomenon that there is a new generation of math and physics grad students who blog. Most of these are very low traffic sites that would raise hardly a blip on the Technorati rankings, but seem to me indicative of an interesting technological shift. Historically, physicists were among the first to have web sites (my father had the second in the State of Washington), however scientists have been a bit slower to embrace blogs than they were the web as such. When I've had more time to survey them, I may provide more targeted links. Cellular Automata in Bio-Medicine by Prof. Gershom Zajicek M.D.who is "exploring ways to boost healing processes in a diseases, and particularly in cancer." Gooseania: My friends invited me over for dinner on Tuesday, just after my theorem was pronounced dead and so I immediately rejected their offer, worried that I'd better get working on something new. NeverEndingBooks: A very pretty blog. The author has two categories for his posts: On Topic and Off Topic, and . . .
Backreaction, the blog of Canadian theoretical physicist Sabine Hossenfelder and Stefan Scherer, a physicist who now works in scientific publishing in Germany. 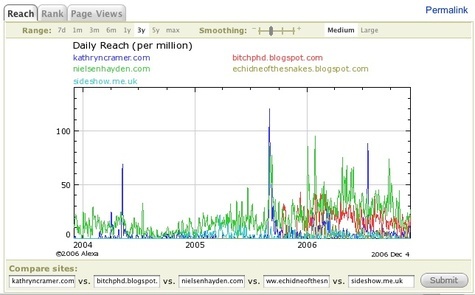 Further to the subject of data, I've had a look at David Sifry's much discussed State of the Blogosphere post. The part I found most interesting is the discussion of splogs and how Technorati deals with them.
. . . some of the new blogs in our index are Spam blogs or 'splogs'. The good news is Technorati has gotten much better at preventing these kinds of blogs from getting into our indexes in the first place, which may be a factor in the slight slowing in the average of new blogs created each day. This relates to something I have been worrying a bit about lately, which is astroturf blogs in quantity founded for an unpleasant and possibly illegal, though not commercial, purpose. I won't link to the example of the phenomenon I have in mind, because that would give them traffic. If, for example, sometime in the near future, a cult were to order its members to all found blogs to attack a particular individual or institution, how would search engines like Technorati or Google react? Would this be seen as covered by freedom of expression, or would it be seen as analogous to to the founding of many erection-enhancement pill blogs? How will this be dealt with? Could offending an organization with fanatical members ruin your reputation on the web permanently? Or is this something that people like Dave Sifry will have to start monitoring? And, if it were happening now, and you were to know about it, what would you be able to do about it? And what if you were a target? What would you do? Write to Dave Sifry? Call the FBI? Hire an attorney? Hire a publicist? How relevant and enforceable are, for example, the cyberstalking laws? 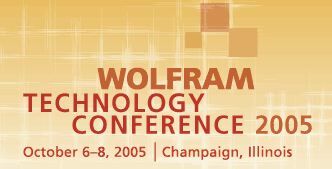 I've posted a bunch of photos from the Wolfram Technology Conference 2006. Enjoy! When Tim Berners-Lee invented the World Wide Web in 1989, he saw it as a collaborative workspace for his fellow scientists at CERN, the European particle-physics lab near Geneva, and beyond. His creation went on to surpass his prediction that "the usefulness of the scheme would in turn encourage its increased use". But in the rush to develop the web as a flexible way to find information, the original concept of users interacting in real time was largely forgotten. Fifteen years later, the web seems to be returning to its roots. . . .
Outside academia, blogs are taking off in a big way. A study published in October by the Guidewire Group, a research firm in new media, says that 90% of marketing communication companies have either launched, or intend to launch, internal blogs. There are now some 20 million blogs, permeating almost every sector of society. But science is a glaring exception, and today there are still only a few dozen scientific bloggers. Scientists who blog see their activities as a useful adjunct to formal journals, not a replacement. "The standard scientific paper is irreplaceable as a fixed, archivable document that defines a checkpoint in a body of work, but it's static, it's very limited," says Paul Myers, a biologist at the University of Minnesota, who blogs at Pharyngula. "Put a description of your paper on a weblog, though, and something very different happens," says Myers. "People who are very far afield from your usual circle start thinking about the subject. They bring up interesting perspectives." By sharing ideas online, you get feedback and new research ideas, he says. A senior US epidemiologist who blogs once or twice a day under the pseudonym 'Revere' on his public-health blog Effect Measure, has attracted a diverse readership. "About 1,500 people visit each day," he says. "If someone told me that I could show up at a lecture hall every day and deliver a short opinion, and that 1,500 people would show up to hear me, I'd be pretty satisfied — 1,500 is twice the subscription of many specialty journals." But for most scientists and academics, blogs and wikis remain unattractive distractions from their real work. Many consider them an online version of coffee-room chatter, background noise that goes against the very ethos of heavily filtered scholarly information. This post has been appreciated on a number of science blogs: Pharangula, Scitech Library Question, Nodalpoint, Aetiology, and Effect Measure. 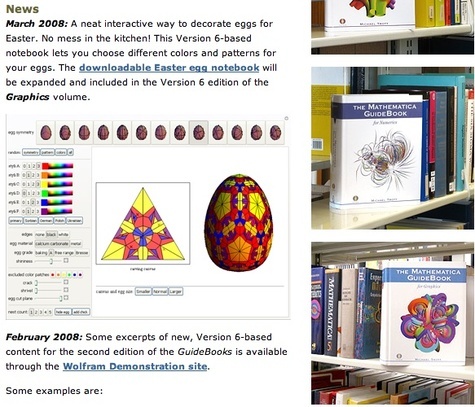 On the subject of science blogging, here's what I want for Christmas: I want Wolfram Research to arrive at an arrangement with SixApart to have some version of WebMathematica run inside blogging software. I've told both companies. I have no idea if anything will come of this Christmas wish. But I think the possibility of having the math out there in a hands-on kind of way would give a big boost to scientific blogging. One reason the scientific, mathematical, and engineering community has yet to embrace the internet is because it is still very difficult to type and disseminate math and scientific notation. Most people just have a querty keyboard and one or two scientific typesetting programs, which may nor may not translate well onto another person's computer. The best solution right now is to convert everything into a pdf file, which is fine for reading, but cannot be manipulated (so it's like reading a book anyway). New technologies are being created right now that will allow for real-time, editable mathematical and scientific dialogue. Once that gets out (that is, once publishers or somebody decides it's worthwhile to buy it and distribute it), then the internet can be a new and powerful force for worldwide scientific communication. Come on Mena; come on Stephen: You can make this happen. UPDATE: Last night I happened across an ISP, HostSRV.com, that specializes in hosting webMathematica sites. I am trying to work out the details of how their services can be integrated with my Typepad account. On the My Wolfram Tones page, click on the Modify button on the tone you would like to add to your sidebar. This will take you to the page for the individual tone. Copy the URL and then go to your My Wolfram Tones Typelist. Click on Add a New Item. Then paste the URL of your tone into the Box that labeled "Enter a URL to quickly add a new link." 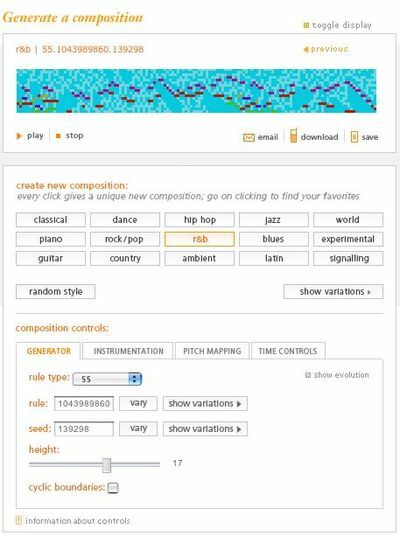 This will add your link to the Typelist, but it will come out with the name "Wolfram Tones: Generate a Composition." You want yours to have a better name, something evocative that is going to make your friends want to click there. So call it something like REVENGE OF THE ANDROIDS! and click "Save Changes." Repeat this process until you've added all the tones you want in your sidebar. Then, go to the "Edit Current Design" screen for your blog and click on "Change Content Selections." Check the box to add your new Typelist to the sidebar, and then click "Save Changes." This will take you back to the "Edit Current Design" screen. This time, click "Change Ordering" and drag your Wolfram Tones sidebar to where you want it. Then click "Save Changes." And when you are back to the "Edit Current Design" screen, republish your weblog. Once you've go the Typelist placed, you can add your new Wolfram Tones whenever you want. Here's a screen shot of my Typelist. How I added the graphics is left as an exercise for the reader. 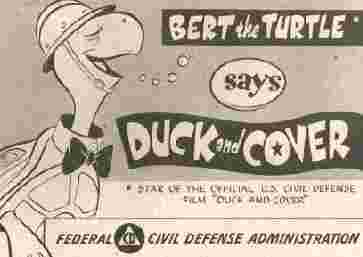 When we had "duck & cover" nuclear drills at my Robert Fulton elementary school (P.S. #8), in the late 1950s, I refused to get under my desk, and got sent to the principal's office. I explained to him that we were directly across the East River from downtown Manhattan, and that Wall Street could be ground zero. I explained that the radius of the fireball varied with the 2/3 power of megatonnage, and that the desk would not give even a microsecond of protection. He agreed, and told me not to tell all this to the other students, as it might frighten them. For that matter, he advised me not to scare the teachers. I did not leave my baby teeth for a "tooth fairy." Rather, I had my Mom snailmail them to someone who was researching Strontium-90 levels in teeth, for fallout research. The soundtrack would be perfect for it because the Ziporps goes like the sound of it's tail clenching onto something. The cymbal drum things sound like that. Also he's scuttle-running. His ecosystem is usually either a pond or a river. He's swimming really fast after a bunch of pond fish and ducks. he's trying to figure out where they're going. Because he knows wherever ducks are going, there's food for them and there' s food for him. He eats duck weed and tiny fishes. He's mostly an omnivore. He's a happy creature and he makes people feel better by doing clown stuff and he jumps up on rock ledges and slides down like it was just sand and it looks as if it is moving. That would really amaze someone. Peter is 8 years old and lives in Pleasantville, NY. He is in the third grade. Also, if your child would like to draw a picture to make a child in the area affected by the earthquake feel better, upload the picture to Flickr with the tag "earthquakefeelbettercards," and email me and I'll see that the picture gets where where going. Ashar's dad has agreed to make sure pictures get printed out and given to children they would help. Pakistan has about 2 percent of the world's population living on less than 0.7 percent of the world's land. Q: What portion of the world's population lives in areas affected by the earthquake? How can you tell? How many of those are under age 18? Extra credit: What is the population density in the most severely affected areas?
. . . let us examine the fate of conventional structures. 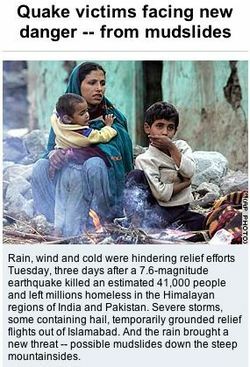 Press reports and television coverage indicate that there has been extensive damage in the mountainous areas of this region. The area in the vicinity of earthquake epicentre is situated at an altitude of 2,000 to 3,000 meters. Seismic vibrations have more amplitude at higher elevations. For example, take a 30-storeyed building. It will have the least vibrations at the level of the ground floor but, as you go higher, the amplitude of the vibrations increase. The earthquake damage in Baramulla, Uri, Poonch, and so on, which are located at heights of about 1,500 to 2000 metres, and at a distance of about 60 to 90 km from the epicentre, was therefore more severe, as compared to the damage at Islamabad or Haripur, which are at a distance of about 60 to 90 km, but situated at an elevation of about 500 metres or so. Follow the link to the Indian Express news story, "Is there anybody out there?" It is the first one I've seen to give any account of what I've suspected was going on in the quake-ravaged hills. Even in the fuzzy Digital Globe satellite images from 1999 -- the best I could get of the region over the internet -- it is apparent on my nice large monitor that the mountainsides are terraced with farmlands, and their creases are dotted with small white rectangles suggestive of roofs. There were people down there. Given confidence at my own skills as a cinematographer by a look through the GoogleVideo, I opened my own account and I uploaded this bad little clip I shot on the 28th of September of my kids in their first encounter with Peter Overmann's Wolfram Tones. It took a while for the busy folks at Google Video to approve my clip, but now it has finally been unleashed upon the public. After dinner this evening, I sat my son Peter, who has just started 3rd grade, down at my computer and let him play with Wolfram Tones for the first time. The first interesting thing that happened was that my daughter Elizabeth, who turns 3 in October, started jamming to the Wolfram Tomes soundtrack on the toy piano in the living room. (I had gotten the video camera out to film Peter, and she started while I was getting set up.) 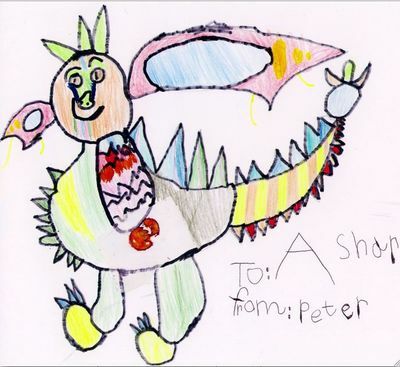 After about 10 minutes of fiddling, Peter came up with something he really liked. I got out the video camera for a kind of personal note-taking to watch how Peter used the program. What happened while I was getting the camera out and turned on, I find quite remarkable: Elizabeth's jamming along with the music coming from the computer is something she usually only does with live music, implying that somehow the music coming from WolframTones passed the Turning test for her. I've uploaded a bunch of photos from the Wolfram Technology Conference, most from Theodore Gray's fascinating collection of the elements. Here Gray poses with a copy of Michael Swanwick's Periodic Table of Science Fiction for which he wrote the introduction. UPDATE: Gray has on his web site the story of the literal periodic table he's sitting on in this picture (many more pictures in my Flickr account). 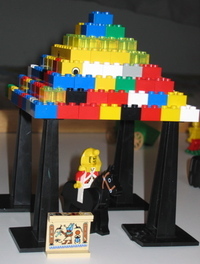 HIs page also contains a discussion of how it was made and many photos of its construction. 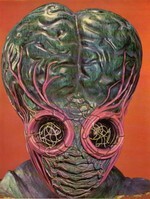 He was also interviewed on Science Friday about this in 2002 (mp3). I found the table and its accompanying collection fascinating because, though I have met many collectors, I had never met anyone before who collected elements. It seems such a logical thing to collect, but it had never occurred to me that anyone would do that. I like my pictures of it, but what that little niche in the Wolfram offices needs is Rosamund Purcell to do it justice. These are objects she would really understand; she is the poet laureate to collection photography. Rudy Rucker's New Book is Out! Rudy gave a presentation on the material covered in the book at the Conference on the Fantastic in the Arts in Ft. Lauderdale, last spring. I was inspired by the presentation to turn my attention back to mathematics and begin to work out how to go about using the program Mathematica with children. So I have already been inspired by this book and I haven't even cracked it yet. We're having a New York Review of Science Fiction work weekend, and already, several people have wandered by and, spying the book on top of the frog terrarium next to my desk, exclaimed, Hey wow, I didn't know this was out yet. PS: Apparently, you can download some of Rucker's recent talks, though I have not tried it. 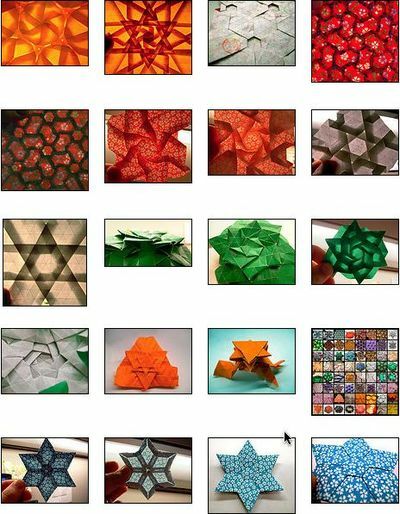 Playing with tags on Flickr, I discovered an account full of origami tessellations. Did I say I'm going to the Wolfram Technology Conference? My son found this caterpillar in our yard Friday. I don't know what species it is. (Anyone know?) I took its picture because of the cellular automata-style patterns on its back. 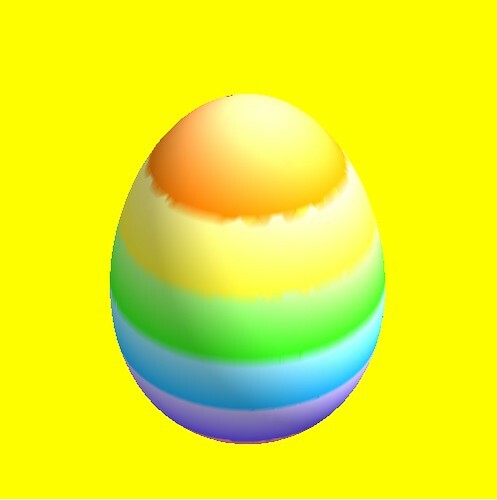 I sent it to the folks at Wolfram, who I'm sure could tell me what pattern that is. I'm a bit unsure what I shold have said this morning when my son's new third grade teacher told me, in the context of a discussion of the math cirriculum, that in the third grade "we don't teach memorization; we teach concepts." Perhaps she was a little too candid. Good thing that here in the Future we can all work out multiplication problems from first principles whenever we need to multiply, isn't it? 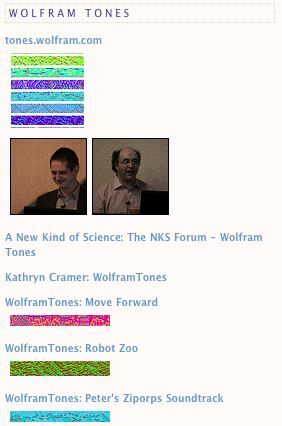 AND NOW FOR SOMETHING COMPLETELY DIFFERENT: In the midst of all this mess, I got an email from one of the folks at Wolfram telling me about their lovely new Internet widget WolframTones, which is essentially the aesthetics of A New Kind of Science rendered as sound. One of the potentially revolutionary strengths of Mathematica is it's ability to render mathematics as sound, allowing us to gain greater understanding of math using our faculties for appreciating and understanding music. I've been looking into this myself, reading up on the neurology of math. One interesting book on this subject I have in hand is Functional Melodies: Finding Mathematical Relationships in Music by Scott Beall. But what is special about the Wolfram version, and sets it apart from other attempts to integrate mathematics and music, is that it takes on the gnarly natural mathematics derived from Wolfram's attempt to parse the complexity of the geometry of nature. The piano selections remind me of Philip Glass's "Closing," which I think of as the best Thinking Music I have in my iTunes. Kingsborough Community College, City University of New York, USA. Basic research, particularly into the psychological and neurological underpinnings of schizophrenia and other "mental illnesses," is flawed because of its adherence to the ideology that unwanted, hard-to-understand behavior constitutes true medical illness. It is argued here that psychiatric diagnostic terms represent moral judgments rather than medical entities. By reducing experimental subjects to a moral label, and assuming that neurological differences associated with unwanted behavior are brain diseases, researchers fail to take into account the conscious experience, organization of self and self-image, patterns of motivation, history and social contexts of their patients. The failure to consider the psychology of their subjects renders the results of these studies ambiguous and irrelevant for any uses except bolstering the biomedical model of psychiatry. And Neural activity associated with metaphor comprehension: spatial analysis. Neurosci Lett. 2005 Jan 3;373(1):5-9. 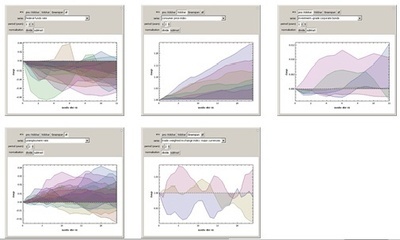 Neural activity associated with metaphor comprehension: spatial analysis. Sotillo M, Carretie L, Hinojosa JA, Tapia M, Mercado F, Lopez-Martin S, Albert J.
Departamento de Psicologia Basica, Facultad de Psicologia, Universidad Autonoma de Madrid, 28049 Madrid, Spain. Though neuropsychological data indicate that the right hemisphere (RH) plays a major role in metaphor processing, other studies suggest that, at least during some phases of this processing, a RH advantage may not exist. The present study explores, through a temporally agile neural signal--the event-related potentials (ERPs)--, and through source-localization algorithms applied to ERP recordings, whether the crucial phase of metaphor comprehension presents or not a RH advantage. Participants (n=24) were submitted to a S1-S2 experimental paradigm. S1 consisted of visually presented metaphoric sentences (e.g., "Green lung of the city"), followed by S2, which consisted of words that could (i.e., "Park") or could not (i.e., "Semaphore") be defined by S1. ERPs elicited by S2 were analyzed using temporal principal component analysis (tPCA) and source-localization algorithms. These analyses revealed that metaphorically related S2 words showed significantly higher N400 amplitudes than non-related S2 words. Source-localization algorithms showed differential activity between the two S2 conditions in the right middle/superior temporal areas. These results support the existence of an important RH contribution to (at least) one phase of metaphor processing and, furthermore, implicate the temporal cortex with respect to that contribution. and Neural correlates of metaphor processing. Brain Res Cogn Brain Res. 2004 Aug;20(3):395-402. Rapp AM, Leube DT, Erb M, Grodd W, Kircher TT. Metaphoric language is used to express meaning that is otherwise difficult to conceptualize elegantly. Beyond semantic analysis, understanding the figurative meaning of a metaphor requires mental linkage of different category domains normally not related to each other. We investigated processing of metaphoric sentences using event-related functional magnetic resonance imaging (fMRI). Stimuli consisted of 60 novel short German sentence pairs with either metaphoric or literal meaning. The pairs differed only in their last one to three words and were matched for syntax structure, word frequency, connotation and tense. Fifteen healthy subjects (six female, nine male, 19-51 years) read these sentences silently and judged by pressing one of two buttons whether they had a positive or negative connotation. Reading metaphors in contrast to literal sentences revealed signal changes in the left lateral inferior frontal (BA 45/47), inferior temporal (BA 20) and posterior middle/inferior temporal (BA 37) gyri. The activation in the left inferior frontal gyrus may reflect semantic inferencing processes during the understanding of a metaphor. This is in line with the results from other functional imaging studies showing an involvement of the left inferior frontal gyrus in integrating word and sentence meanings. Previous results of a right hemispheric involvement in metaphor processing might reflect understanding of complex sentences. Through most of my career as a mother, I have made it a point of aligning my interests with my children's interests. This has taken me to many interesting places, taught me many interesting things, and even gotten me published in the science magazine Nature (reprint on Fantastic Metropolis). One puzzling phenomenon I've observed watching 2nd graders is how kids, who are only just getting basic addition and subtraction of multidigit numbers by the tail, can spend literally hours trading Pokemon cards (by which I mean 2 or 3 hours at a time). The decisions of whether or not to trade are based on multiple factors, some of which are linear functions like how many hit points does a given card have (or is the sum of the hit points of the two cards you are offering me equal to or greater than the hit points of the card of mine you want), and some of which are binary (is it a "shiny", i.e. a holographic card). I spot-checked Peter's sense of the relative value of cards back in February. I had him show me what he thought of as his three best cards. I priced them on Cardorder.com. The cheapest of them came in at $47.00. I then had him show me three of his cards that he thought of as "not-so-good." Cardorder.com priced those between 75 cents and $3.00. Given what I know of the scholastically measurable of the math skills of the kids in question, there has to be some kind of pre-verbal calculation going on. They seem to me to be carrying out complex calculations involving multiple variables of different types, and arriving at basically correct conclusions via some kind of folk-math. One other implication of this phenomenon, it seems to me, is that the equals sign, as a piece of mathematical notation, is highly socially embedded. I remember something about a second grade playground bead market at Ravenna during recess that spontaneously emerged and then spread until teachers banned it after a few weeks. It may be that there is a developmental phase around 7 or 8 in which the social embedding of trade is explored. I would be interested in your anecdotes about young kids and card trading. I've decided to investigate further. I should also say that this realization was inspired partly by Munir Fasheh's essay "Can We Eradicate Illiteracy Without Eradicating Illiterates? ", an expansion on a paper given at a UNESCO meeting in Paris, on 9-10 September, 2002, to celebrate the International Literacy Day. The meeting was entitled "Literacy as Freedom." My 'discovery' of my illiterate mother's mathematics, and how my mathematics and knowledge could neither detect nor comprehend her mathematics and knowledge, mark the biggest turning point in my life, and have had the greatest impact on my perception of knowledge, language, and their relationship to reality. Later, I realized that the invisibility of my mother's mathematics was not an isolated matter but a reflection of a wide phenomenon related to the dominant Western worldview. In this sense, the challenge facing communities everywhere, is to reclaim and revalue the diverse ways of learning, teaching, knowing, relating, doing, and expressing. This reclaiming has been the pivotal theme of my thinking and work for the last two decades. My concern is not about statistical measures - for example, how many learn the alphabet - but about our perception of the learner and what happens to her/him in the process of learning the alphabet. My concern is to make sure that the learner does not lose what s/he already has; that literacy does not replace other forms of learning, knowing, and expressing; that literacy is not considered superior to other forms; and that the learner uses the alphabet rather than be used by it. My concern is to make sure that in the process of eradicating illiteracy, we do not crush illiterates. In the 1970s, while I was working in schools and universities in the West Bank region in Palestine and trying to make sense out of mathematics, science and knowledge, I discovered that what I was looking for has been next to me, in my own home: my mother's mathematics and knowledge. She was a seamstress. Women would bring to her rectangular pieces of cloth in the morning; she would take few measures with colored chalk; by noon each rectangular piece is cut into 30 small pieces; and by the evening these scattered pieces are connected to form a new and beautiful whole. If this is not mathematics, I do not know what mathematics is. The fact that I could not see it for 35 years made me realize the power of language in what we see and what we do not see. Her knowledge was embedded in life, like salt in food, in a way that made it invisible to me as an educated and literate person. I was trained to see things through official language and professional categories. In a very true sense, I discovered that my mother was illiterate in relation to my type of knowledge, but I was illiterate in terms of her type of understanding and knowledge. Thus, to describe her as illiterate and me as literate, in some absolute sense, reflects a narrow and distorted view of the real world and of reality. A division, which I find more significant than literate and illiterate, would be between people whose words are rooted in the cultural-social soil in which they live - like real flowers - and people who use words that may look bright and shiny but without roots - just like plastic flowers. I’ll be performing with Phil Curtis at a small-scale event called ELSA, that is, ELectron SAlon #11, on Friday, June 3rd , starting at 8 PM . I’ll read my story “Ain’t Paint” which appears in my forthcoming The Lifebox, the Seashell, and the Soul. Phil will create some appropriate heuristic electronic music on the spot, and for video, we’ll use live demos of nine of my CAPOW software Zhabotinsky scrolls; the guys shown below. . . .
Phil and I will go first, so if you want to see us, you actually have to be there at 8. Usually at ELSA events there’s some free wine and food. It’s almost like a party. Set 3: The inimitable DJess and mixmaster, Ms Pinky, a. k. a. P. Minsky, with friends. The venue is Next Door, 1207 Soquel Avenue, Santa Cruz, CA 95062, 831-429-1596. Next Door is next to the Rio Theater, see map. I had Mathematica with me; I owned it personally. It wasn't even a copy that NASA had bought for me. And I had intended to work on tensor calculus in all that free time that I was going to have. And I had it along with my music CDs in my CD pack that NASA nicely made for me, in the Spektr module. I also had it on the hard drive, installed on a laptop in the Spektr module. But there was an accident. An experiment in which the crew was to try to dock a Progress convoy vehicle to the station didn't work out and caused severe damage to the Mir. A simple TV image was used to measure the rate at which we were closing in. That's "black ground rush" to a parachutist. As you come in closer, the image gets bigger, and you can try to use that to calculate what the speed is while at the same time deriving a closing rate. Then you figure out the docking, using a little joystick to fire the thrusters. As you know from the media, this was a terrible mistake. It left the station not mortally, but severely, wounded. The Progress basically impacted, we think now, on this part of the solar array on the Spektr module, and then it bounced and slowly floated away along the base block. The Progress weighs seven tons. We think it collided at about three meters a second. I was in the base block; I didn't see it at all. Sasha Lazutkin saw it; he told me, in all haste, to go straight to the Soyuz escape craft, and as I was passing into the node region of the Mir, I heard a big thump. . . . It had hit the Spektr module. If we'd been strapped in, we'd have all been shaken around. This is just the opposite of being on Earth, where you're in a car and you're always supposed to strap in. Bash the space station, and nothing happens to you because you're not in contact with the station -- an interesting backwards twist. Like any good hard SF protagonist, Foale set out to do a bunch of calculations aimed at solving the problems encountered by the crew of the crippled space station. (For those who want to know all about the calculations, the keynote speech discusses them in detail.) He whipped out his trusty slide rule. Well, no, it was a little more complicated than that. The task was this: when you lose attitude control on the station, what happens? The station, low-powered, starts to tumble; then the solar arrays are no longer pointed toward the sun; and then slowly the batteries of the station start to deplete, because the solar arrays aren't charging the batteries. And then in about two or three hours you have no power on the station. Gyrodynes, the momentum wheels, are always acting, spinning at different rates to change the orientation of the station very slightly. Once the station's lost all its power, or the guidance and control system has failed, the gyrodynes start to spin down, and that momentum gets transferred back into the station. It spins in the opposite direction to the gyrodynes. Lo and behold, because you have twelve gyrodynes all spinning and working really well to do a nice job at holding the station in attitude, as the space station loses control of those gyrodynes and the gyrodynes spin down, then the space station picks up all of the angular momentum that was in the gyrodynes and starts to spin in the opposite way -- and in an unpredictable way. So my whole task was to basically try to figure out what the rotation was, null it, establish an orientation, and then spin. But the problem with the station is that it has unequal moments of inertia. So, hard SF readers. You're in a damaged space station and you need to do some calculations on your computer. But the power keeps going out. Your install disks for the crucial program flew out will the escaping air when the station was damaged. People on the ground are trying their darnedest to help. What else can possibly go wrong. Read it and find out! Actually solving the equtions seems to have been the least of the problems. PS: Further to the subject of math, check out the amusing flame war in the reader review section of the Amazon page on Stephen Wolfram's A New Kind of Science; the book, published 3 years ago, has 318 reader reviews so far.